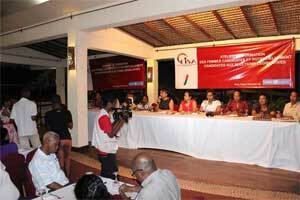 As part of the support to the Caucus of Women MPs, initiative, a "talk across generations" dialogue was organised. The dialogue was attended by MPs, Ministers, political leaders, activists and 88 young Malagasy from the 22 regions of the country. From 13 to 14 August 2015, EISA trained 30 parliamentary assistants of 30 Women MPs to better perform their duties and work. The workshop aimed to enhance women MPs participation in the National Assembly by providing them with a skilled and effective team. The training focused on three main areas: role and responsibilities of a parliamentary assistant (technical assistance in the legislative process, communication etc. 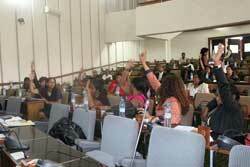 ), their mandate regarding to the Malagasy Law and gender issues in performing an elected position. It is worth to note that this was the first time in the history of the National Assembly that the parliamentary assistants benefited from such training. The Secretary General of the National Assembly who represented its Speaker, the President and the Secretary General of the Caucus of Women MPs (SOMAMI) and few Women MPs participated in the opening and closing ceremonies. 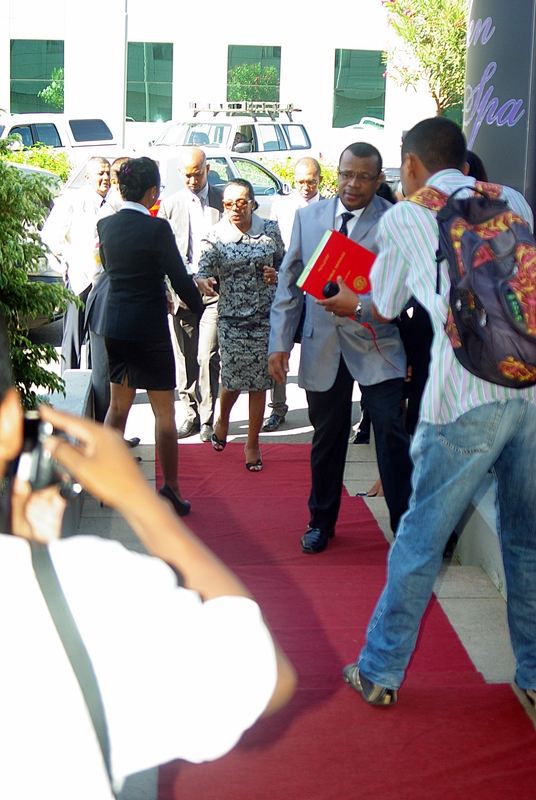 As part of its programme which aims at strengthening the National Assembly , EISA developed a Directory of Malagasy MPs. This document provides detailed information about the 151 Malagasy MPs. 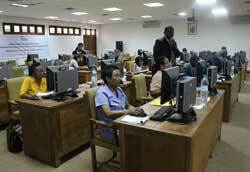 It was produced to facilitate linkages between the MPs and their constituents. From 3 to 5 December, EISA conducted a training workshop for 40 participants (25 MPs including 14 women MPs, and 15 parliamentary assistants). The training workshop covered two main topics, namely the use of a check-list to assess gender mainstreaming in a particular bill or any draft law and an introduction to Information and Communications Technologies (ICTs). As a result of the workshop, the participants agreed on the need of applying a "gender lens" to the analysis of any draft law. Prise en compte de l'égalité Hommes-Femmes dans le processus législatif à Madagascar est le fruit de la collaboration entre l'Institut Electoral pour une Démocratie Durable en Afrique (EISA) et le Fonds des Nations Unies pour la Démocratie (UNDEF) dans le cadre du Programme de promotion de la représentation des femmes malgaches dans les sphères publiques et politiques. Assemblee Nationale 2014 "Dissémination du rapport sur la prise en compte de l'égalité Hommes", [www] http://www.assemblee-nationale.mg/?p=8201 (opens new window, accessed 19 Jan 2014). 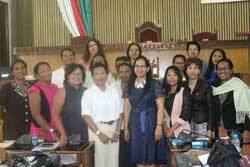 On 6th of November, EISA Madagascar organized the second strategic meeting of Malagasy Women MPs Caucus. A new President was elected. The second strategic meeting of Malagasy Women MPs Caucus was held on 6th November in the plenary hall of the National Assembly in Tsimbazaza. The purpose of this session was to elect the president and members of the board. Raharimalala Toto Lydia has been elected as President. 5 vice presidents from 5 regions of Madagascar, 1 secretary general and 1 treasurer were also designated. 21 women MPs, including the deputy Speaker of the National Assembly and the president of Gender Committee, attended the meeting. Assemblee Nationale 2014 "Election de Mme Le Député RAHARIMALALA Lydia", [www] http://www.assemblee-nationale.mg/?p=8203 (opens new window, accessed 19 Jan 2014). On 6 October 2014 EISA Madagascar's new Projects Manager, Onja Ramiliarijaona, met with the Speaker of the National Assembly, Jean Max Rakotomamonjy, to present him with the new cooperation program between EISA Madagascar and the Malagasy Parliament. During the meeting, the Speaker reiterated his commitment to collaborating with EISA to strengthen the capacity of Parliament to make it more effective and to make its functioning, structures, methods and work more democratic. 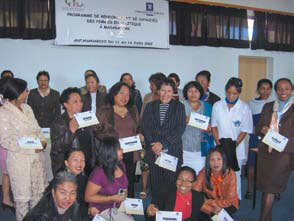 The cooperation program includes the integration of equality of men and women in the legislative process in Madagascar. It should be noted that this initiative falls in line with the initiatives already undertaken by EISA Madagascar together with Parliament over the past two years [see articles below], namely the strengthening of the capacities of women MPs, technical and financial support for the establishment of a caucus of women MPs (SOMAMI) and the production of a report on gender mainstreaming in the legislative process in Madagascar. The first meeting of the women's parliamentary caucus for gender equality (May 26th 2014). The second orientation workshop, which was intended to familiarize women parliamentarians with both the formulation and evaluation of public policies, as well as with the budgetary role of the Parliament. The activity that was held on May 26th served as an opportunity for women parliamentarians, who joined together in the Solombavam-bahoaka Mampihatra ny Miralenta (SOMAMI, or "Members of Parliaments for Gender Equality"), to pinpoint the strengths and flaws of their caucus, as well as to prioritize their own needs, in order to develop their future strategic action plan. It is worth pointing out that the aforementioned women's parliamentary caucus has been launched officially during the first orientation workshop on legislation and the legislative processes, organized by EISA on March 19th for women parliamentarians. Women from all political sides, as well as the Vice President of the National Assembly, Mrs Hanitra Razafimanantsoa, attended the event. On May 27th-28th, the second orientation workshop on public policies and the budgetary role of the Parliament was conducted by EISA for women parliamentarians of Madagascar. This event was principally aimed at sharing basic knowledge on the formulation and evaluation of public policies, on the eve of future parliamentary debates. It also included a training session for the honourable participants on their role in the national budgetary process. The workshop was officially launched by the President of the National Assembly, Mr Jean Max Rakotomamonjy, who praised EISA-Madagascar's initiatives to promote greater women's participation in national governance, and expressed both his support and encouragement to the organization, throughout his speech (See EISA Madagascar on facebook). Furthermore, he emphasized the need for such actions in the current post crisis framework and in the context of consolidation of Malagasy institutions. Assemblee Nationale 2014 "Atelier de Formation des Parlementaires", [www] http://www.assemblee-nationale.mg/?p=8213 (opens new window, accessed 19 Jan 2014). Midi Madagasikara 2014 "Formation sur le Genre et les NTICs", 6 déc, [www] http://www.midi-madagasikara.mg/societe/2014/12/06/african-democracy-strengthening-formation-sur-le-genre-et-les-ntics/ (opens new window, accessed 19 Jan 2014). Newsmada 2014 "Parliament : une prédominance masculine à l'étude", 6 déc, [www] http://www.newsmada.com/2014/12/06/parlement-une-predominance-masculine-a-letude/ (opens new window, accessed 19 Jan 2014). EISA-Madagascar a organisé, à l'Ibis Hôtel de Antananarivo, son premier atelier d'orientation des femmes parlementaires. Etaient invitées 22 femmes-députés de l'actuelle législature. La cérémonie d'ouverture de l'atelier a vu la présence de Mme Aurélie Razafinjato Présidente du VMLF ainsi que de Mme Marie Zenaide Lechat Ramampy Présidente d'honneur du VMLF - CNFM. La touche particulière de la cérémonie a été la participation de l'Honorable Madame Christine Razanamahasoa Présidente de l'Assemblée Nationale et première femme présidente d'institution à Madagascar. L'ensemble des intervenantes ont loué l'initiative portée par EISA et se sont félicitées que les efforts consentis depuis 2007 par cette institution aient abouti à l'élection de 32 femmes à la chambre basse malgache. Pour sa part, la Présidente de l'Assemblée Nationale a souligné l'importance capitale d'un tel atelier d'orientation du point de vue du renforcement des capacités des élues. Celles-ci devraient approprier les questions abordées en vue d'une contribution qualitative dans les futurs débats parlementaires. Tout en marquant sa disponibilité pour soutenir de telles initiatives, Hon. Mme Christine Razanamahasoaa terminé son propos en formant le vœu que le partenariat ainsi amorcé entre EISA-Madagascar et l'institution qu'elle préside se perpétue. 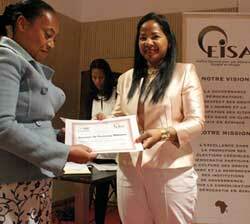 EISA trains women in Madagascar to effectively stand as candidate and increase their chances to be elected during the 20 December 2013 legislative elections. An overall 176 female candidates, across parties and movements as well as independent, have already been equipped with skills and tools to be ready for these elections. Key components of the training received from EISA include confidence building, message development, voter targeting, campaign planning, public speaking, and media relations. The workshops have also provided a space for first time candidates to benefit from the experience of women who have contested elections in the past or have held prominent political responsibilities in the country. Besides training female candidates for the legislative elections EISA is also running a national media campaign aimed at raising the interest of women to enter the political arena, galvanising voters to support female candidates, and highlighting the benefits of the inclusion of more women in the decision-making process for the Malagasy society as a whole. EISA's support to increased women's participation in the decision-making process in Madagascar is made possible through funding from the Norwegian Ministry of Foreign Affairs and the United Nations Democracy Fund (UNDEF). Over the past few years EISA has built capacity of local stakeholders to facilitate workshops to strengthen women's participation in decision-making processes. To strengthen these skills, convened a workshop to upgrade the skills of facilitators who attended the previous EISA train the trainer programmes. This workshop also provided training on how to use the revised pagivolte toolkit developed the previous year. The pagivolte is a series of pictures through which key messages are transmitted through images telling stories of everyday life, making it easier to understand by the beneficiaries and their involvement in trade. 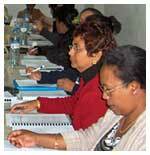 EISA trained 32 facilitators in the use of the pagivolte in a workshop held in Antananarivo. These facilitators are now able to use this tool alongside the other training material that they use. The use of pictorial imagery and conducting the course in and printing material in the Malagasy language has proved extremely successful at community level. 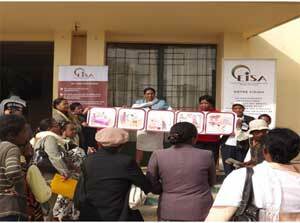 A major achievement for EISA Madagascar has been our engagement with women at community level over the past few years providing capacity building programmes on the EISA "Women's Participation in Decision-Making Processes". In particular is the design of innovative training material for women at community level. Nine workshops were held in Boeny (April 2011), Sud Ouest (June 2011), Sofia (January 2011), Vakinankaratra (April 2011), Atsinanana (May 2011), Haute Matsiatra (May 2011), Amoron 'i Mania (June 2011), Diana (November 2011), and Analanjirofo (October 2011) in which 175 women participated drawn from different sectors of society. An example of the diversity of participants is reflected in the workshop held in the Analanjirofo region in October 2011 where the profile of 31 participants from six districts reflected: Professors: 51.61%, public administration sector: 6.45%, veterinarians: 3.23%, working in the region: 6.45%, housewives: 16.13%, community health agents: 6.45%, with 9.68% from non-affiliated organisations. Through EISA's capacity building programme local facilitators were drawn on to facilitate the workshops providing them with opportunities to strengthen their facilitation skills. This has proved so successful that these facilitators, given the level of formal literacy of participants, adapted the tools very creatively to encourage greater participation, understanding and discussion around the concepts and information contained in the training programme. EISA also collaborated with the Forum for African Women Educationalists (FAWE) to design a training tool for local women with low levels of formal literacy. 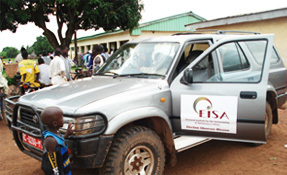 The tool is based on EISA's capacity building programme. To ensure that the training tool was responsive to local women EISA and FAWE designed a toolkit composed of a pagivolte, a pictorial illustration of a particular topic, with a manual for the facilitators explaining how to use the pagivolte. This has proved to be an extremely effective method to engage women at this level. Local radio stations agreed to conduct interviews with some of the beneficiaries of EISA 's training programme at the community level. This provided an opportunity for these women to discuss the inclusion of women, and what women should do to participate in decision-making processes at all levels. The radio programmes provide an effective platform for the workshop participants to talk to a wider audience about some of the learnings and experiences of the workshops conducted by EISA . During 2010, these broadcasts took place in three regions over a three month period. During 2010 EISA continued providing capacity building workshops to communities at grassroots level as well as to women in positions of leadership at local level. These included six capacity building workshops in six regions involving 240 women at community level and four Train the Trainer workshops training 80 local facilitators selected from the capacity building workshops, equipping these women with the necessary skills to facilitate workshops in their own areas for local organisations and associations. In this way EISA achieves its objective of building local capacity and expertise to ensure long-term sustainability of its interventions. These women are also able to reach the more remote areas that EISA is unable to reach. Agenda 21 (Chapter 37, UNCED, 1992) defines capacity building as "… encompass[ing] the country's human, scientific, technological, organisational, institutional and resource capabilities. A fundamental goal of capacity building is to enhance the ability to evaluate and address the crucial questions related to policy choices and modes of implementation among development options, based on an understanding of environment potentials and limits and of needs perceived by the people of the country". Within the context of this definition, the capacity building programmes were designed for women specifically with regard to their entry into the political arena. The programme had two components, the first of which was a practical component that included information on how to prepare a manifesto, prepare an election campaign, how to use the media and design a public outreach programme. The second component provided the opportunity for women to explore issues on gender stereotyping and its impact on women, women and leadership, societal, cultural and traditional perceptions of women and more importantly assertiveness and confidence building skills to support women in breaking free from these stereotypical roles. 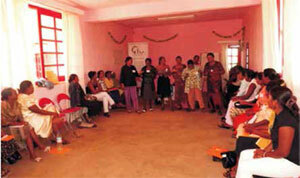 Workshops were held with women in leadership positions at local level and with women at community level. In keeping with EISA's commitment to building local capacity, a train the trainer workshop was held in Antananarivo in June 2009 and was attended by 20 facilitators from different organisations. Supported by EISA, two of the newly trained facilitators conducted a workshop in Antsirabe for 25 women representatives at local level from three regions of Madagascar, including mayors, local councillors, chiefs of region, chiefs of districts and chiefs of Fokontany.Two other workshops for women's empowerment at local level were conducted in October and November 2009 in Sambava and Morondava and were attended by 68 participants. The workshops evoked keen interest, so much so that a weekly radio emission on a local channel in Morondava talking about the content of the training manuals was established by a participant. EISA designed facilitators' and participants' manuals to build the capacity of women at local level. The first manual addresses women representatives, such as the mayor, the regional and local councillors, chief of region or chief of district, etc. This is an interactive practical manual providing skills and knowledge in both soft and hard skills including women in politics and their different roles and functions, the instruments protecting the rights of women and promoting gender equality, basics of management, leadership skills, conflict management, policy making, drafting of legislation, governance and accountability, and budget formulation including monitoring, implementing and fundraising. The second manual is designed for participants at the grassroots level and introduces them to concepts such as lobbying, designing an election campaign, speech making, preparing a manifesto and so on. It also focuses on skills such as leadership and public speaking. This manual is more accessible and understandable to the women at local level, with simple exercises and examples, as well as more details about the Malagasy context and the Malagasy laws. All the materials are written in French and Malagasy. EISA designed a facilitator and participant's manual translated into Malagasy and French. Although the basis of the content was generic, local context content was informed by the discussion that the preliminary team had had with the various stakeholders to hear the concerns and needs of women and men on the challenges faced when trying to enter the decision-making arena in Madagascar. The manual included both 'soft' and 'hard' skills, such as assertiveness and confidence building, understanding gender and gender stereotyping, the legal and constitutional framework, writing a manifesto and designing a campaign and public outreach. The workshops formed the core of the programme with participants coming from 17 of the 22 regions in Madagascar and 180 women exposed to the content. In addition, EISA facilitated two Train the Facilitator workshops for 60 women so that they could extend the programme to their own constituencies in their regions. EISA also drew on women already in leadership positions to share their experiences with participants. A total of 40% of participants came from women's organisations, 25% from political parties, 25% from the professional sector and 10% from faith-based and civil-society organisations.